All transactions are safe and secure with a reliable history in online purchasing behind each of our associates. 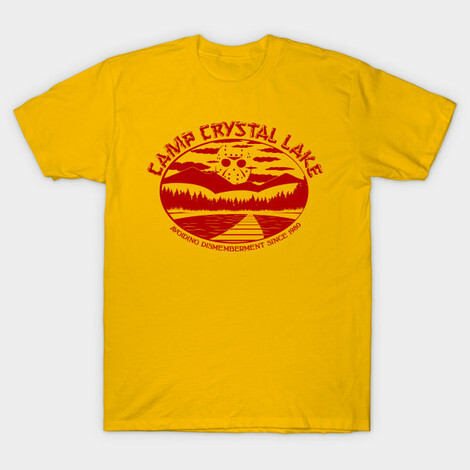 Buy the Camp Crystal Lake t-shirt to own Friday the 13th clothing and merchandise. These Friday the 13th t-shirts display a logo for the summer camp that can't always promise that your kids will still be breathing when you pick them up. Disregard the stories that you've heard about the careless camp counselors who let a young boy drown back in 1957. This Camp Crystal Lake t-shirt promotes the idea that the camp can once again be a place of safely had fun and bonding with nature. In addition to the Camp Crystal Lake tee above, browse the Friday the 13th Clothing Gallery for more apparel like men's and women's clothes, kids shirts or hoodies.